If I had made this list in order of preference—beginning with the song which I think does the most to differentiate the inspired version from the original, this would be it. The Andrews Sisters’ song is repetitive and positively bland compared to Ravi’s breathtakingly sensuous version. The interludes—now wind instruments, now piano accordion—Geeta Dutt’s breathy and sultry singing, the brilliant orchestration: all of it make O babu o lala a superb example of what inspiration should be: merely something to help you surpass the original and take a road completely different. Salil Chowdhury’s song begins very differently from the well-known classical piece by Mozart, but soon turns into a fairly faithful rendition of the original. He does revert to form later in the verses, where it’s Salil again, not Mozart; but I’d still list this as one of the most easily recognisable inspirations from classic Hindi cinema that I can think of. This song doesn’t just sound like the original, it even has almost the same words in the refrain: Aao twist karein means more or less the same as Come on let’s twist again. In both cases, it begins with the singer (Chubby Checker/Mehmood) “talking to the audience” before launching forth into song. But there onwards, RDB leaves the inspiration way behind: his version has way more pizzazz, with clapping, hooting, and more to add variety to the music. And Manna Dey? He’s just too good. I have to admit: I can’t vouch for the accuracy of the version I’ve been able to unearth on youtube of Szla dzieweczka do laseczka (which warrants another confession: I can’t even begin to think how to pronounce that). Szla dzieweczka do laseczka is a Polish folk song, and Salil Chowdhury certainly used a good bit of it to create Dil tadap-tadap ke. A more Indian version, but with Polish roots all right. This is one of those songs I’d list really as an inspiration rather than a faithful copy—the start of Jeevan ke safar mein raahi is almost identical to that of the Mexican hat dance, but after that, the two tunes go two very different ways (literally like raahis—travellers—parting ways?) Both tunes are lovely, but I think S D Burman’s is the more interesting one, with some wonderful variations and flourishes. I have Richard to thank for this one: he told me about it when I reviewed Samadhi and raved about Gore-gore o baanke chhore. Edmundo Ros’s classic Chico-chico is so undoubtedly the source of Gore-gore o baanke chhore. C Ramchandra does manage to redeem himself somewhat, in the verses of the song, which are very different from Ros’s version. Usha Khanna’s score for her first film, Dil deke dekho, has the dubious distinction of being ‘inspired’ by as many as four Western songs, from the blatantly obvious Meri Neeta, copied from Diana, to this one. I’ll give her more credit for Dil deke dekho, though: the chorus is from the tune of Sugar in the morning, but beyond that Ms Khanna brings in some fairly original interludes, with guitars and violins giving this a fairlydifferent feel from Sugar in the morning. Tequila has long been a favourite in India (I guess long before most people even knew what tequila was). And Kishore Kumar paid quite a tribute to Tequila by composing this song, which is pretty much an as-is copy of the original. This is one tune where I do think the copy lacks the zip and pep of the original: Tequila gets diluted as Baba loo baba loo baba. Also from Jhumroo. Thandi hawa yeh chaandni suhaani has long been one of my favourite songs, in fact the main reason why I slotted Kishore Kumar as a highly underrated music director. Alas, I am proven wrong. Our man lifted this tune almost verbatim from Julius la Rosa’s Domani. The start is, almost note for note, the same, though Kishore da does redeem himself somewhat by making the verses more soulful and beautiful than in the original. Not one of those immediately obvious ‘inspirations’ (I’d heard both tunes dozens of times before I realised they were too similar for it to be a coincidence). Which I think says a lot for O P Nayyar’s skill in adaptation—Ae dil hai mushkil has very different interludes (I love the harmonica, the tonga beats, the violins, the piano—everything!). Another of the songs that’s better in the copy than in the original. So what are your favourites? And no Anu Malik examples, please! What an awesome list! I am so glad you did this. I did suspect that a lot of my favorite SD Burman and Salil Choudhury tunes were inspired by Western classical music (the beginning of Hum aapki aankhon mein, for e.g., screams Western Classical to me) but dont know enough about Western music (not to mention, being absolutely tone deaf!) to be able to match up music. I’ll be back to check out all these “inspiring” songs. Kishore liked Western songs a lot. 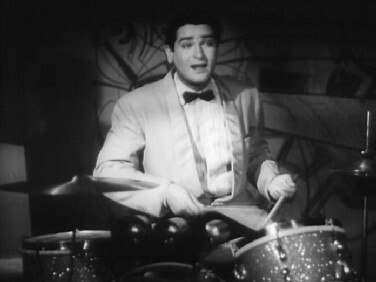 In ‘Chalti Ke Naam Gadi’ at least two (“Ek Ladki Bheegi Bheegi Si” and “Ham The Woh The”) were inspired by Western tunes according to Kishore’s wishes. They’re better and different from the originals though (especially with Anoop’s legendary performance in the latter song). http://www.youtube.com/watch?v=t2qOE8Dz_mw&feature=related <— inspiration for "Hum The Woh Thi"
http://www.youtube.com/watch?v=zUpTJg2EBpw <— "Ek Ladki Bheegi Bheegi Si"
I didn’t know about Hum the wohi thi; thank you! We have discussed El ladki bheegi-bhaagi si and its resemblance to 16 Tons later on in these comments – I thought it was mainly in the interludes that you could see a definite likeness; otherwise changes have been made. Could it be Under the Bridges of Paris? Could Under the Bridges of Paris be behind Hum aapki aankho mein? Just listened to it (I didn’t recall having heard it before) and couldn’t really spot any similarity – but then I’m not an expert at this sort of thing. I think that requires a more trained ear than I have! O thanks for digging up the original of dil tadap ke keh raha hai from Madhumati. I heard it for the ffirst time, when I met a Polish student group in 1993. They were sing this song and I thought oh they are singing my fav song. Thanks for another lovely post. Talking of inspired songs, I hope you are aware of itwofs – a site devoted to chronicling such inspirations. It is run by one Karthik S. He was featured on CNBC. I once ran a quiz where I played the original clips and the audience identified the Hindi film song that was based on it. Bagheera! Thank you for that CNBC link! The “itwofs” site merely LISTS the songs, while you have made an analysis/review and that too, in a more presentable manner like you always do. Makes a much better and interesting read. Thanks! I agree with you completely over O babu o lala. RAvi’s composition is so lively and seductive. The same is true for Dil deke dekho. Usha Khanna and Mohd. Rafi have induced life in an otherwise quite streamlined music.! Actually, going over this list again, I realise that (with the possible exception of Tequila/Baba loo baba loo baba), in just about all instances, I like the ‘inspired’ version more than the original. Our music directors certainly knew how to infuse life in otherwise somewhat boring, monotonous tunes! Ouch! Don’t tell me all of these songs are copies of something else? There are a lot of songs there that I like a lot! Great list, and thanks for linking to me. Thanks for the song: itni badi mehfil aur yeh dil kisko du. I knew this song: but never realised that it had the same melody as the banana boat! Helen is so young here and she doesn’t have her cat-like grin throughout the song, which was her trademark! Richard, thank you for Itni badi mehfil – I haven’t seen or heard that song in ages. (The last time I remember seeing it was when I saw Dil Apna aur Preet Parayi, perhaps 25 years back…? I think I can be pardoned for having forgotten it!) But yes, such a very faithful copy of Day O, isn’t it? While we’re on Harry Belafonte: I thought I recalled having heard that Jamaica Farewell had been copied too. A look at itwofs, and they have a suggestion: Do chamakti aankhon mein. Pretty similar, I think. Thanks for all that hard work in unearthing these songs dustedoff. But at the same time I do think that most of them just had a short similarity, not the whole song. Am I right or just clutching straw? Its a song ‘The beat is crazy’ or something like that. I heard someone say that once so I’m really not sure if it is correct or who sang it. memsaab: Thank you for that! Zindagi mein pyaar karna seekh le completely slipped my mind – I should’ve remembered that, since I also like Andorinha Preta a lot (I like almost anything by Nat King Cole). The chorus is almost exactly the same, but I’m glad the rest is sufficiently different – and nice! pacifist: I don’t think you’re clutching at straws! I think so too. There are a few exceptions (Meri Neeta is embarrassingly like the original), but I think more often than not, the ‘inspiration’ was limited to a short but recognisable section! By the way, Suku suku didn’t just copy music, it also copied a look and an idea – from different sources, though. The original was the film Artists and Models; the palette and the girls pretending to be blobs of paints couldn’t be a coincidence, could it? By the way, according to itwofs, the original music of Suku suku (not to mention the words) was from Nina and Frederik’s Sucu Sucu. Dustedoff, yes, “Do Chamakti Aankhon Mein” is definitely inspired by “Jamaica Farewell”! Harry Belafonte was a big voice in my early childhood, deeply embedded in my memory (I guess because my parents were fans), so these Belafonte-inspired songs are a lot of fun for me. Me too! My grandfather used to work for the Indian Gramophone Company, so whenever we visited my grandparents, we’d get to hear some of the LPs he had at home – and Harry Belafonte was everybody’s favourite – mine, my sister’s, my cousins’, my uncle’s and my aunt’s. Such a gorgeous voice. Thanks, Shalini! And I agree, really – I do find it fascinating (especially when it comes to fabulous songs like O babu o lala!) to see how tunes get redesigned and refashioned… that requires some talent, too! I’d forgotten completely about If it’s Tuesday this must be Belgium – that’s an example of a song that’s been definitely changed for the better. In fact, I’d say R D Burman made it a lot better than the original. Chura liya hai is awesome! dustedoff: We had the original sucu sucu record (45 rpm), and the inspired one was my sisters favourite: in the days when there were live orchestras in restaurants and she was the only child, apparently drove everyone crazy by requesting that song over and over again…who could refuse such a cute, chubby child? Now that my kids have taken up western classical music, there are sudden moments when you almost seem to recognise something, must be because of all the inspired songs! Which song was inspired by this one? bawa: Do share some of those bits of Western classical music that you suddenly seem to recognise! When it comes to Western classical, I am very fond of the more famous pieces of music – Vivaldi’s Four Seasons, Beethoven’s Fifth and Ninth, Strauss’s Blue Danube, Wagner’s Ride of the Valkyries and a handful of others… and, of course, Mozart’s Fortieth, which I seem to share with Salil Chowdhury! Would love to know if there are other well-known pieces of Western classical out there that our composers were ‘inspired’ by! harvey: Ohhhh! I’d no idea! I like the picturisation of Dekhne mein bhola hai better, but Waheeda Rehman and Suchitra Sen… hard to choose! Thank you for this. :-) And yes, happy birthday, Waheedaji! harvey: nice link! And which other song from the same film was based on this – no prizes! Dustedoff: sometimes the reminder is too tantalising..its there, but you can’t pinpoint, so it might be coincidence. But they do play a lot of composers less-known in India: Fauré, Stamitz, etc. and a lot of Mozart, Bach, Haydn but smaller chamber music pieces. There’s so much out there…and sometimes you go, “I have heard that before differently! !” but its hard to follow up…could be coincidence too. Isn’t this inspired by a song that goes something like ‘Oh Oh Oh Bernadine’? Hildebrand: Geeta’s voice on anyone is a pleasure!! ;-) But yes, the combination of that gorgeous voice and that perfect face is quite matchless! But pacifist is right, I think – this definitely sounds more like Oh Bernadine. pacifist: Yup, I think you’re right on that. It sounds more like Oh Bernadine than Oh my darling Clementine. Thank you! @ bawa: Maybe you should have announced prizes, cause I’m too dumb to recognise ist. will have to go thro all bombai ka babu songs. I understand what you mean with pieces from western classical music. Happens to me as well. Lata said in some interview that Salil Choudhary would often lend her his western classical records to listen to. Another of those songs from Bombai ka Babu which I like. But my heart’s beginning to sink; Dekhne mein bhola hai was ‘inspired’, this one was almost an exact copy… what next? I hope Chal ri sajni was original! yes, pacifist is right. I mixed up the track name. Reminded of another inspiration, Hum Tum Jisse Kehte Hain Shaadi from Kagaz ke Phool has some similarity in its melody with one of my favourite songs of the 50s, Que Sera Sera Whatever will be will be from The Man Who knew too much, sung so well by Doris Day. Indian films for some reason seem to lift more from the albums than english movies for some reason. Now I think I’m going to have to do a second post on ‘inspired’ songs! Thanks, Hildebrand, for that one – I hadn’t noticed it, but there’s a definite feel to Hum tum jise kehte hain shaadi of Que sera sera. But you know something? There was something else – an elusive something – in the verses of the Hindi song, which I’m certain I’ve heard elsewhere, but also in a Hindi song… oh, this is getting frustrating! dustedoff: that sinking feeling…I do hope chal ri sajni and others were not inspired or copied as in the case of pawan chale to…it is one of my favourite soundtracks! In fact, one of the biggest hots of the 90s – I was in cut-off from india period at the time- internetless era – Aashiqui, was a much-awarded score. It was really decent for the times too. When my younger sister bought it over for me, she sulked for days cos I kept saying that one of her favourites from the soundtrack- Tu meri zindagi hai- gave me the deja vu..it was copied from somewhere. She insisted it was because songs based on same raags might sound similar. Later, thanks to youtube, I found the proof…knew had heard it before!! Sorry, hot should be hit. Promise this is the last of my comments on this entry. I just had time today to look at the itwof site cited above: and I think we should come with an award for a composer who has not yet appeared on Any Lifted List. Of the famous ones, I can see Naushad being no. 1 ultra flyweight champ, as he does not appear to have lifted anything in his entire career, along with Ghulam Mohammad. Madan Mohan has 2 less-known tunes. Others may keep adding composers to this list. Oh, my goodness. Poor Tassawar Khanum seems to have really inspired some very blatant copying – and with the lyrics being copied too! Suddenly my respect for our composers and lyricists has gone a few notches (though I must admit I never did like the music of the 80’s and 90’s too much, anyway). I had a closer look at itwofs, and am with you on coming up with an award for anyone who didn’t copy tunes. I guess Naushad being so very classical in style would not have much cared for Western or even folk music – or maybe he just had compunctions! Shankar-Jaikishan seem to’ve lifted tunes right, left and centre. And Anu Malik is in a class by himself. (and hey, I don’t mind at all if you go on adding comments! I get to learn something new every time). Naushad, never having lifted a song. I also want to add that we have even being lifting from regional films of the indian subcontinent even in the 50s not just now. S.D. Burman had this lovely geeta song in Ek Nazar 1951 picturised on the Lovely Kuldip Kaur, Bas Chupke Hi Chupke Se Pyar Ho Gaya. The tune is a lift as are parts of the lyrics. Its probably the first song we lifted from a Pak film! Where was it lifted from? A superhit Gujrati film Garba song Taliyon Na Taale also sung by Geeta for Mangalphera (The movie that had Nirupa Roy arriving with a big bang as heroine) with music by the great maestro Avinash Vyas. So basically, Hindi movies get inspired from everywhere. Hildebrand, I’m getting more and more disillusioned. :-( That thread about Naushad was rather damning, though I’m not sure whether everything on it was true – so much of what is said on threads such as these turns out to be something somebody thought they knew… but on the other hand, it could well be true. And here’s an anecdote regarding Hindi songs being lifted from regional cinema: I’d gone with some relatives to a restaurant called Bhojohori Manna in Kolkata. Lovely place, and they play music from old Bangla films. And every now and then, the song would be one which I could easily sing along to – in Hindi! S D Burman and Salil Choudhury at least seem to have based a lot of their tunes on tunes from Bangla films – sometimes their own, of course. 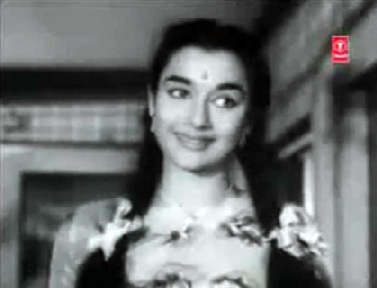 the lovely Tumi Je Amar from Haranosur 1957 later turning up as Chale Hum kahaan in the same movie Police 1958. Quite a few times lyrics also got translated a bit. Like the lata non-film bangla song by Salil, Ja Re Udey Ja Re Pakhi became Jaa Re ud ja re panchhi later! Then of course, we’ve had so many bengali bilinguals from the time of old Calcutta film industry like kanan Devi’s lovely Jawab in hindi being Shesh Uttar in Bangla. Later trend is less but very much there. For example, Samanta’s Aar Paar in 1985 being Anyaay Abhichaar in Bengali (That movie had an exact equivalent in Hindi with the same singers even. 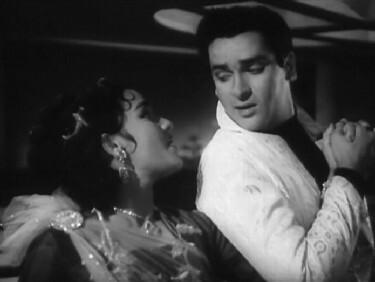 for example Sabina Yashmin-Kishore had the “fishy” tandem solo song version Rui Katla illish donoy haaye re keeje kori in the bengali movie which became Kaunsa dariya kaunsi nadiya in Aar Paar!). Reminded of another lovely one by Salil. Hemant sung Amaye Proshno Kore Neel Dhrubo Taara which returned as the superhit Maine Tere Liye Hi Saat Rang ke Sapne in Anand. Its been covered so many times later, I can’t find the bengali original on Youtube but many covers! 1] Mere baat rahi mere maan mein[Sahib biwi aur ghulam]-Ami dur hote tomare.The bong one is in hemanta’s voice. 3] Aha rimjhim ke yeh pyaare pyaare geet[usne kaha tha]-Aha oi aanka banka je path.This one is sung by Shyamal mitra , the legendary singer and composer of bangla songs.Music & lyrics by Salil chaudhary. 8] Sawan mein Barkha sataye[biwi aur makan]-ke jeno go dekeche amay[monihar].Music by Hemant kumar. The bengali lyrics of all these songs of S.d.Burman were Written by his wife Meera dasgupta. 15] Songs from film Rajkumari with music by Panchamda.Now rajkumari was a hugely hyped bangla film starring Uttam kumar & Tanuja in lead roles.But sadly the film with its songs turned out to be a flop[which was a rare thing for uttam kumar films and more so as Uttam-tanuja pair was superhit in bengali] and left Panchamda devastated as he had worked very hard on its music.But justice was delivered as all the songs of rajkumari turned out to superhit in their hindi versions. 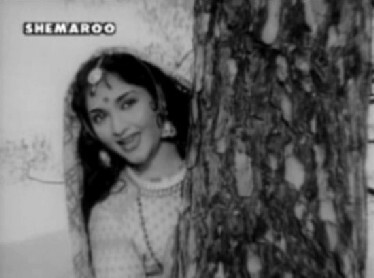 a] Ke jae bhabi elo melo-Yeh jawani hai deewani.The bong one is sung by Asha tai and is picturised on HELEN! The Pyaar deewana one you already know,so i am not listing that one. 17] Dil mein ho tum[Satyamev jayate]-Chirodiner ami je tomar[Amar sangee].Music by Bappi lahiri. Other than reusing their own tunes,all the bong composers would at various times borrow from giant Bengali composers like Rabindranath tagore,Kazi nazrul Islam,Atulprasad,Rajanikanta,D.L.Roy etc and also from various folk forms of bengali songs like baul,bhatiali,sari,dhamail,jhumur etc and padabali kirtan also. note-The restaurant ‘Bhojohori manna] that you went to in Kolkata is named after one of the biggest hit song of Manna dey in bengali ‘Ami ShriShri Bhojohori Manna’ from the movie Prothom Kodom Phool.That song too has a unique history about it ,but i won’t tell it now as the comment has already become too long and maybe a bit tedious too. 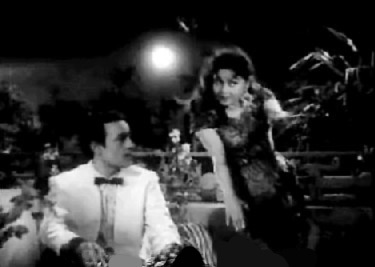 By the way, as far as I remember, there’s another song from a Bangla film that’s also picturised on Helen – with Uttam Kumar. But the song itself has Hindi lyrics. I’ve forgotten which one it was, but I remember Tom Daniel pointing it out to me. I loved that one. I remember being told about the story behind the name of Bhojohori Manna when I visited. One of the owners had come to our table to talk to us, and she told us a bit about it. Something about a cook who travels far and wide searching for good recipes, or am I mistaken? Do share the story! yes, the list is quite big.As i said earlier that such a list has innumerable songs.Many of those songs I still have not listed but i won’t bother you anymore as of now.And you may take as much time as you want to go through these songs. Now for the story of ‘bhojohori manna’.Well you are partially right .The song is about a cook who has traveled far and wide and has such a wide variety of recipes and is such a brilliant cook that no one can beat him.Manna is the name of this cook.Bhojohori in bangla means a cook. Now few people know that singer Manna Dey is also a brilliant cook and that this song is written on him.The lyricist of the song Pulak bannerjee [Who is one of the greatest lyricist for bengali songs and is Uttam Kumar’s uncle] once went to manna dey’s house.Mannada welcomed him and since Mannada’s wife was not at home,Mannada himself went to cook chicken for his guest.The delicious smell of cooked chicken made Pulak Bannerjee wrote this whole song in 20 minutes [the time that Mannada took for cooking].Pulakda said that he wrote this song appreciating Mannada’s culinary skills.Mannada loved the lyrics and then Sudhin dasgupta composed a tune for the lyrics and the song featured in the movie Prothom kadam phool and was picturised on Samit Bhanja [ of Guddi fame] ,who made a guest appearance in this movie Starring Soumitra and Tanuja.The movie became superhit and the song went on to achieve cult status. 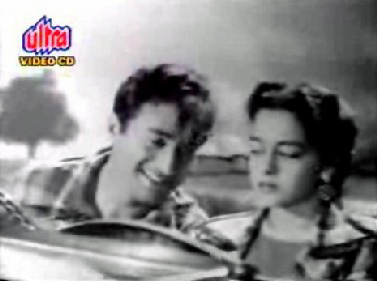 yes the song that is picturised on helen and Uttam kumar is in the movie Gali theke Rajpath and the lyrics goes by ‘tere liye aaya hai leke koi dil’.Sung by Geeta dutt and Music is by Sudhin dasgupta and lyrics are by Gulzar.Quite a few bong movies of these days had songs with Hindi lyrics. What I can’t work out in that Naushad post- mostly due to the layout which drives me nuts- are the actual songs being copied. Would love to have concrete examples, not that I am “putting my hand in the fire” for any composer at this stage. Yes, the layout drove me nuts too. Some specific songs are mentioned in the last paragraph, right at the bottom of the page. The writer says that Aayi saawan rut aayi, Dharti ko aakash pukaare and Aaj mere man mein sakhi were all copies of other songs. Also a part towards the end of O duniya ke rakhwaale. An amazing post!!! Though inspired/copied, some of them sound much better and more lively in Hindi. One day, on my way to work (couple of years back), I heard eruvaka sagaroo rannoo chinnana in the cab. I was so set to sing <Dekhne mein bhola along, and then was surprised to learn that it was in Telugu, but never knew it featured Waheedaji. Mahesh Bhatt’s movies lifted not just the tunes but lyrics as well from Tassawar Khanum numbers!!!??? Ya! I’m fast losing my faith in those who make the Hindi film industry. And of course, it isn’t limited to just tunes and lyrics; entire stories too. I used to be very fond of the Vinod Khanna starrer Inkaar until I saw Akira Kurosawa’s brilliant film Tengoku To Jigoku (‘High and Low’) and discovered that the first half of Inkaar – minus the romance between the characters played by Vinod Khanna and Vidya Sinha – is almost a scene-by-scene re-enactment of Kurosawa’s film. I’ve been listening to Geeta Dutt’s “Babuji dheere chalna” over and over again these last few days–an improvement, if I may say so, on Quizas, quizas, quizas. I’ll have to bookmark this page–lots of good information. bawa: You’re so right! I’ve been spending a lot of January getting to know a bit more about Indian regional literature -I wish more of it was translated into a language I can understand – and there are just so many wonderful stories out there. Even if a film maker likes a story so much they feel compelled to borrow, the least they can do is acknowledge…? sophy: Thank you for that! I had no idea Babuji dheere chalna was an inspiration too. I’ve just been listening to Quizás Quizás Quizás and I agree completely: it’s far superior! From where is Ek ladki bheegi-bhaagi si taken? acknowledgment for using dressed up traditional folk tunes and ….PAYment for wholesale lifting of other music director/lyricist’s work?? Also it seems to be a “chori & sinachori” thing: after this post have been reading a bit, and apparently the Aashiqui score and songs got about 15 awards between them, and the music director of that “Agar tum mil jao” film was crying “foul! murder!” for not getting the Filmfare award that year. With this acknowledgment thing: I am now wondering whether people are aware that so many of Reshma’s and Nusrat Fateh Ali Khan’s songs have been hindified and used in films: I thought everyone knew and that it was acknowledged by the music director as such, but a comment by a friend has set me wondering if it is so: do you know? I think at this point we should draw a line between the use of Mozarts 40th to create “Itna na humse tu pyar barha” and all this lock, stock and barrel lifting, where the originality seems to have come from stuff like changing bandigi = aashiqui. Oh, yes – I agree with you completely on that. The shameless lifting of tunes as in the case of the NFAK/Reshma/Mehdi Hassan songs is in a different league altogether – Salil Choudhary, SDB, etc actually improved and improvised and often lifted the original tune into a very different realm (in most cases I’d say the ‘inspired’ version was way better than the original – O babu o lala is a case in point). BTW, do you mean Mera piya ghar aaya was originally written by Bulle Shah? I love that song (the NFAK version, I mean). Yes, Mera piya ghar aaya is a Bulleh Shah composition: good that songs written in 18-something can still be everyday stuff. And, of course, Hindi cinema too likes Khusrau: remember Zubaan-e-yaar-e-mann Turki from Ek Musafir Ek Hasina? The title of the song – its main line – is by Khusrau. He wrote some amazingly universal and timeless poetry. 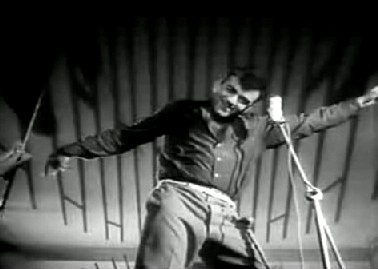 dusted off: Ek ladki bheegi bhaagi si is supposedly lifted from 16 Tons–Ernie Tennessee Ford. Kishore himself said that in an interview (it’s on youtube). But I also saw it on the youtube comments for the song. It’s not a close similarity–I don’t hear it at least (except in the background). Ek Ladki in my opinion could have been inspired by any number of American country blues tunes of that period. dusted off: Sorry for multiple comments. I listened to the Tennessee Ernie Ford song again and yes, I can see quite a lof of it has been kept in Ek Ladki Bheegi Bhaagi si. Many of the old melodious Shankar Jaikishan nos were lifts or inspired (what ever we may want to call them). Primary example are the lovely songs from Chori-Chori. sophy: You must never be sorry for multiple comments! :-) I welcome them – and thank you for that. I’ve just finished listening to 16 Tons, and I think it’s mainly the interludes that remind me of Ek ladki bheegi-bhaagi si. The rest is pretty much a change from the original. But when I was listening to 16 Tons, I was certain there was another song, in old Hindi film music, where I’d heard that… haven’t been able to figure out where, yet. Filmbuff: Ah, yes – I used to like Jaana suno hum tumpe marte hain until I discovered the truth behind that! But frankly, I’ve come across too many absolutely blatant lifts in 90’s film music to be surprised any more – Come September, for instance, had at least two almost exact copies: Dole dole dil dole from Baazi and Nazrein mil dil dhadka from Raja. Thank you for those recommendations! I do think, though, that later music directors have been less innovative about ‘inspiration’ – they usually tend to pick up a piece of music and use it as is. Anu Malik is especially guilty of that. Music directors in the 50’s and 60’s seem to have actually (most of the time) been ‘inspired’ to produce something that can be identified with the original but is also a fairly different tune. Was just in the mood for humming punjabi songs when i found myself mixing it up with a very nice mumtaz number, and I thought- oh no- dustedoff “inspiration” strikes again! sung by Surinder Kaur, among others. Funny how I have never realised it before. And I was humming – just a few minutes back – the old lullaby Lullaby and goodnight, Mr Sandman is calling – and was thinking how, when my sister used to sing it to her babies, we never knew it was actually a Brahms tune! Well, not exactly inspiration, really, since Brahms’s words were also a lullaby, but still. 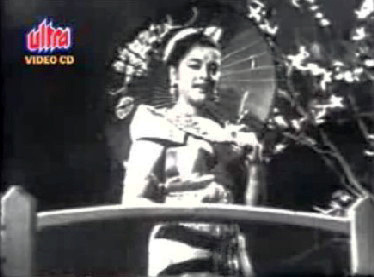 bawa: Kale rang da paranda is copied not only in Koi shehri babu, but also in Pakistani singer Ali Haider’s song Gore rang ka zamana (1990). excellent job. who is original? we come back to classical ragas be Indian, western or Arabic etc etc. And this is the beauty of classical ragas. i think any music director copying a tune must acknowledge it ,it will not make him small. people will appreciate such things. Very frankly, Hemu, I hadn’t heard of Ron Goodwin till now. Thank you for that! I’ve just been listening to Desert Hero, and you’re so right, it’s definitely Baaje payal chhun chhun. I guess no-one thought of those because I’d started off saying this post was about songs inspired from Western tunes. Helps limit the scope a bit! I got a doubt for 4. It’ not gajeczka but laseczka. I’m Polish and the difference between those two words is quite a big deal – gajeczek is a big forrest in a bush kind with laseczek is a forest in general. OMG most of my favorites songs are copied.. Then why some guys blame on present generation music directors.. As far as i know Rahman alone is a complete music director in india.. He never copied tunes.. Only loops and beats (commercial) used by him.. Hats off to him.. The one thing I’d say in favour of most of the old brigade of music directors is that even when they used other tunes as bases, it was mostly really inspiration, not blatant lifts of other tunes. A Jeevan ke safar mein raahi is only very slightly like the original, unlike (say) Nazrein mileen dil dhadka, which is Come September played by an Indian orchestra. Almost no changes whatsoever. I really accept that most of the old brigade of music directors are far far better than current generation music directors.. (especially copycats like Anu malik, Bappi Lahiri).. But Rahman is ahead of all the present music directors.. He never copied any tunes.. Only few commercial loops and beats are used by him. I have never seen a single full tune copy by him.. I am not going to compare Rahman with old brigade of music directors(thats not good.Technology improved a lot these days).. My point is that you people must accept that Rahman is also a great music director.. Thats all.. And i feel that he is one complete music director in india and he creates original tunes(No copies) after all..
you are right. Rahman is rightly given the title “The Mozart of Asia”. He never copied tunes from others. That makes him different from other music directors. “Strawberry Ankhein” is such a song composed by Rahman. Great string arrangements. Great Tune.. Great Backings. I love the 2nd interlude specially. Such an energetic beat. He is the pride of our nation. Admin sir, may i know your opinion about the song “Strawberry Ankhein”? Sorry, haven’t heard it… this, by the way, is a blog almost exclusively for pre-70’s films. It’s not as if I don’t watch new films or don’t listen to new music, but I must admit to being horribly out of date. “Gore Gore O Banke Chore” is much better than the song it is inspired by imo (the verses are the best parts anyway) and Nalini is amazing in that song! I also think the way the verses are sung in the Hindi song is much more interesting than in Chico chico. And yes, I agree with you completely: Nalini Jaywant sparkles in that song! the same name. I don’t think he’d ever acknowledged that fact. Talking about folk tunes, there are so many examples of lifting. As for example, take the song “Ek Pardesi Mera Dil Le Gaya” (MD: O.P. Nayyar) from the film Phagun… this is a blatant lift from one well known Bengali folk song “Beder Meye Jyotsna Aamay Katha Diyechhe”, which originally is a song from Bengali ‘jatra’ Beder Meye Jyotsna. 1. “Bandhu Tindin Tor Barite Gelaam” made popular by Runa Laila is the source of inspiration of ” Jahan Char Yaar Mil Jaaye” (MD: Bappi Lahiri) from Sharabi. 2. “Allah Megh De Pani De” by Abbasuddin Ahmed have two direct inspirations. : One from Guide, sung by SDB himself. another was ” De De Pyar De” again from Sharabi. 4. Bengali spiritual folk song “Hari Din To Gelo Sandhya Holo” was lifted by Rajesh Roshan to make ” Chale Hum Do Jan Sair Ko” from Yugpurush. 6. The opening of “Aaja Nachle” from Aaja Nachle (MD: Salim, Sulaiman) was a blatant copy of the Bengali folk song “Dada Paaye Pori Re”…made popular by Anshuman Roy. There are many other “inspirations”, I suppose, yet to be charted. I hope to write another post concerning Rabindrasangeet (Tagore song) and Nazrulgeeti (songs of Nazrul Islam) inspired Hindi film music shortly. Au revoir, my friends. Eh kanchha malai sunko tara tipideu na/Tyo tara matra hoina jun pani jhari diula. RD Burman is said to have been quite fond of Nepali songs of the time and injected some tunes into his songs as well. Oh, I didn’t know that! :-) Interesting – Dewaana mujhsa nahin happens to be one of my favourite songs. I tried searching for an mp3 or video of the Nepali song, but no luck – though I did discover that it was sung by “the nightingale of the hills”, Aruna Lama. Thank you, Simplegal! Lovely song – and RD Burman seems to have remained fairly faithful to the original, especially as far as the chorus is concerned. 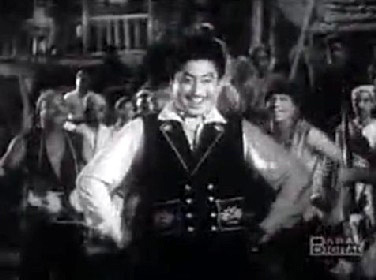 4] Yodelling portion of Nakhrewali[new delhi],which he again repeated in his bengali laugh riot lukochori in the song Ek poloke ektu dekha. Another person who used to contribute to song composition was anand bakshi. You know, this list was made more than 1 1/2 years ago… and since then, I’ve ‘discovered’ many more songs that I like, some of them even inspired. So I’d probably qualify this list by saying that it’s a list on that day. My list today may be at least slightly different. And the song I’d throw out would be Babaloo babaloo. I love the initial humming of Thandi hawa yeh chaandni suhaani too – it’s beautiful. Also in Mere mehboob qayamat hogi. I like some of the other songs you’ve mentioned too – especially the title song of Jhumroo; Koi humdum na raha; and Aa chalke tujhe… lovely music, in all of these. well,even though your list was made nearly 2 yrs ago,it’s a great list.I was just saying that babaloo was not that good to be on that list given the quality of other songs listed there.And i really appreciate people like you who have the talent and perseverance to maintain such a top class blog.I for myself never find the patience nor the perseverance to start, let alone maintain a blog of such high standards. My goodness, Raunak! That is very high praise; I am feeling really humble. Thank you so much. Kishoreda also composed some great songs in bengali like ‘Nayani sarasi keno’ and ‘Sei raate raat chilo poornima’.These two songs are hugely popular among the bengalis.Kishoreda also composed a bengali song for lata mangeshkar ‘ki likhi tomay’ which was a big hit. Will check them out right now! Thanks. Thanks for checking those songs out.Here are two more great songs in bangla which are sung by kishoreda and are incredibly popular. 1] Ami chini go chini from world famous film Charulata,directed by Satyajit ray.This one has music and lyrics by Rabindranath Tagore and is picturised on Soumitra Chatterjee. 2] Ei toh hetay kunja chaya-this song is really beautiful and one of my dad’s favs.Now my dad does not have a great liking for music but this song he loves deeply and so do I.Whenever i want to make my dad listen or grab his attention,i play this song along with few others which are his favs.Whenever he listen to this song,he invariably stops whatever he is doing and it becomes mighty easier to talk to him. This song has lyrics by Gouriprasanna Majumdar and music by Hemant Kumar and is sung by Kishoreda along with his first wife Ruma guhathakurta.Picturised on Kishoreda and Anita guha[famous for her deity roles ,especially as Santoshi Maa in Jai Santoshi Maa]. 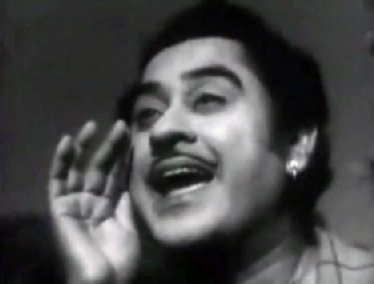 Trivia-The second song features in the Movie Lukochori,the same film in which Kishoreda repeats his yodelling in Nakhrewali in another song Ek paloke ektu Dekha.This movie was produced by Kishoreda along with Chalti ka naam gaadi in the hope that both films will flop and he will save himself from the income tax department.But,alas, both the films turned out to be huge hits, in fact the biggest hits of that year in their respective languages and Kishoreda spent rest of his life dealing with Income tax department raids and atrocities. well,as far as I am concerned ei toh hetay has no similarity with Dhanno Dhanya pushpe bhora , but that’s maybe because i know bangla very well.If i did not know bangla,then they might have sounded similar to me.Anyways there is no similarity as both the songs have very different tunes but they both do possess the distinct bengali touch.Dhano dhanya pushpe is my Favourite patriotic song too.Written and composed by Dwijendralal roy ,after whose son Devika rani renamed Yusuf Khan as Dilip Kumar. 2] M.S.Subulakshmi’s version as a tribute to her teacher Dilip kumar Roy. 3] The version from Uttam kumar starrer Agnishwar-it’s in two parts.Heavily Recommended. I’ve heard the MS Subbulakshmi version, but not the others. Will search them out and listen to them. the hemantda version is the best.You should try that.The agnishwar version too has vocals by hemant da but i recommended it separately as it is a double treat with uttam kumar and hemant kumar in tandem. you are so right,so much to watch and so less time.I too have many movies whose vcd’s or dvd’s i brought from the market but could never find the time to watch.I have a cupboard in my house which is full of movies.I have never actually counted but i am sure my cd stock runs into 1000 atleast. [i am not joking].Many of these i have never seen.e.g. I watched Mirza Ghalib about 2 yrs later after i first bought its vcd. Does anyone know which hindi song sounds very similar to the tune “Similau” by bert kempfert in his record swinging safari. I hadn’t heard Perhaps perhaps perhaps before, even though I like Doris Day a lot. Yes, there’s a definite resemblance to Babuji dheere chalna… no other that I can think of. Yes, there’s no question that Babuji dheere chalna is a cover of a version of this song. Whether of Perhaps perhaps perhaps or of the original quizas, quizas, quizas, I wouldn’t like to guess. I’m a big Doris day fan, and I like quizas, quizas, quizas, but the modern cover of Babuji dheere chalna, from Salaam-e-Ishqdeserves special credit for being very authentic in capturing innate seductiveness of the song – it’s pitch perfect in both delivery and picturisation, I think. One of very few Bollywood covers that I consider to be at least as good as the inspiration song. I’d never seen this one before, Stuart! Yes, good one as far as the essence of the original song is concerned – it’s different (of course), but what it conveys is the same. Ah, Salaam-e-Ishq is one of my modern favourites, a Bollywood remake I prefer to its Anglo original, and this cover of babuji dheere chalna is part of the reason for that. Now I must watch it! Thanks for the recommendation, Stuart. It has its flaws, primarily the usual problem of Bollywood bloat, but even though I really like Love Actually, and saw it first, S-e-I wins for me. Govinda is great in it, too. Contributing to the thread a bit late I know, but still. A little while ago songs lifted from Belafonte featured rather prominently here. May I proffer one more example, a ghastly desecration of a song (and singer) I love? Or perhaps resemblances to ‘Matilda’ are unintended and purely coincidental, I suppose. Ewww! I hadn’t heard this song before, but Matilda has been a huge favourite of mine since I was a kid – it was on one of our Belafonte LPs, and I loved every bit of it. I want to add some, hope the page isn’t overloaded.I do like these songs despite the inspirations btw. Wow. I didn’t even know there was a Hindi adaptation of this one! I am all admiration for you, Chris! You’ve managed to come up with some really little-known songs. I hadn’t heard this one either (though the original, I’m familiar with). Good one! Oh, yes – I’ve heard April fool banaaya. So this was where it was from… and Laila o laila too. What a hit that song was. Those are the pre 70s ones. This is cute! Nice song. :-) I personally think Thodi der ke liye mere ho jaao is more slick and seductive! so did Ravindra Jain partly use a Pakistani tune in the song or am I wrong? If No, delete this comment. No idea. I don’t know if it just happens to be a coincidence, but I can see a resemblance, certainly. seems to be inspired from”I Want To Hold Your Hand “by The Beatles………………………. Oh, yes. When I wrote this post, I hadn’t seen Jaanwar for many years, and had forgotten all about this song. (It probably wouldn’t have made the cut anyway, because I don’t like it much), but it’s certainly worth listing on this page. Thanks for that! What an interesting post, you didn’t think it will snowball into so much info on inspired songs, did you ? May I add a few ? Background and interlude music is ditto “Ms Marple” theme from the movie. I will post the right mukhda again, I will lose all this again, if I checked now. Another one from punjabi, kaali Teri gut te para ad tere lal in, roopak ki o raani.. Thank you! And yes, you’re right about me never realising how many comments this post would spawn, and how it would snowball. Truth to tell, ever since I’ve posted this (some years back), I have myself come across several other songs which are obvious copies of others. The Nusrat Fateh Ali Khan song is ‘na to butkade ki talab mujhe’ the tune on which naa to kaarwan ki talaash hai is based. That wasn’t ‘inspired’ as in ‘stolen’. Both Nigaah-e-naaz ke and Na to kaarvan ki talaash hai were composed by the late Ustad Fateh Ali Khan (Nusrat Ali Khan’s father), and were used by Roshan with the latter’s permission. Ah ! Thank you for the information. Good to know. I don’t remember whether it’s in one of the comments here or elsewhere, but yes, later I did get to know that Autumn Leaves was the basis of Jaan-e-chaman shola badan. Odd that I didn’t notice it, since I’ve been very fond of both songs since I was a teenager! I guess SJ did a good job of being inspired by that one. “Jaane Chaman Shola Badan” & “Is tarah aashiqi ka” are mentioned in http://www.itwofs.com. Surprisingly I didn’t find any mention of “Tum Bhi Chalo Hum Bhi Chalen” is lifted from“Autumn Leaves” anywhere on itwofs. A fast paced jazz guitar styled “Autumn Leaves” was also signature tune of Radio Indonesia Barat in the 90’s. I was searching for it all along for it until I found Stanley Jordan’s version. I grew up with Nat King Cole’s version of Autumn Leaves; I actually hadn’t heard it sung by anyone else till a few years back. Also lyrically to some extent. Yes, the list actually is endless. I compiled this post several years ago, and as the years have gone by, have discovered how several more of my favourite songs have been inspired from already existing tunes. This old Tamil film song from “Madurai Veeran” (circa 1955-56) always reminds me of the later Amitabh no. “Mere Aangan Mein”., the initial parts. Am I correct? Quite a no. of Tamil film songs of the 1950s and 1960s, especially tuned by one Veda for Modern Pictures, were straight lifts from popular Hindi nos. of those days. This, at least, is a reverse, according to me. Any comments? I can see a passing resemblance, but not much, to be honest. A more direct lift is Dekhne mein bhola hai from Bombai ka Babu, which was an almost exact copy of a song from a Telugu movie starring Waheeda Rehman. I’m afraid I don’t know the name of the song – though I have seen it; it’s a street performance, with a very young Waheeda dancing. I don’t know if this song has already been covered, but “Dil Dilse Milakar Dekho” sung by Kishore (there’s an Asha version also) for the film ‘Mem Saheb’ composed by Madan Mohas is lifted from “the Isle of Capri”…..https://www.youtube.com/watch?v=W5DhePdIlo4. Yes, I agree: there are lots of Western songs I came to know of only through their Indian versions! And in other cases, there have been Western songs so skillfully adapted that one can barely recognise the original in it – that happened to me with songs like Rum and Coca-Cola, O my darling Clementine and Autumn Leaves – all of which I was very familiar with, even fond of – but couldn’t recognise them in their Hindi avatars. I’ve been stumped by a classic song and I’m not sure where else to turn to seek answers. I was listening to SD Burman and Geeta Dutt’s classic “Tadbeer Se Bigdi Hui Taqdeer,” recently. And for the very first time. Tremendous song, of course! But there’s a motif in it (you can first hear it from about 1:06 to 1:14 in the video to which I’ve included a link) which I have heard. And many times. Certainly a much older song than those I tend to know well. It’s driving me crazy, not being able to remember the song. I just wondered if anybody could help point me in its direction. I’m at a loss. I have absolutely no idea. :-( Will send this link to my father (who is more knowledgeable, both about 50s Hindi film music and old Western music than I am). Somehow, I’ve heard Tadbeer se bigdi hui taqdeer bana le so many times, I now associate that bit of music only with this song! That’s very generous of you. Thanks! This is an incredible post/comments section, by the way. So many people with so much knowledge. I’ve learned a lot. Great blog! I discovered it by reading your posts on [i]Bhabhi[/i] (1957) and [i]Pyaasa[/i]. You’ve provided people with a really incredible resource, here, so I thank you! Well, it seems I don’t know as much about formatting on this website as I thought. Ha. But here’s my own simple contribution. This video should be set to start at 18:05. Another wonderful blogger helped me to remember that this cue has been recycled from SD Burman’s own earlier score for Abhimaan (1973). And I then heard this. I’ve heard Mr Lonely before, but I’d never recognized that little snippet of tune in Chupke-Chupke as being derived from it. Thanks for that! I am good at identifying songs but I’ll admit i have been confused all my life between initial tunes of two songs one is jaaney kyu log mohbhat kiya kartein hai to milti hai zindagi mai mohbhat kabhi kabhi and yeh hai reshmi zulfo ko andhera na ghbraye to aao huzoor tumko sitaaro mein le chalu. ithink the latter is genuinely confusing. when R.D burman came on vividh bharti he said the song of sagar sagar kinarey dil yeh pukarey is isnpired from rahey na rahey hum mehka karengey bun k kali bun k sabaa if i remember the song correctly. . he said their is difference of metre. . i don’t have knowledge of music. so i don’t know much n remember what he exactly said about difference. It’s not just Sagar kinaare dil yeh pukaare which was inspired from Rahein na rahein hum (which in turn was almost an exact copy of Tera dil kahaan hai); so was Humein raaston ki zaroorat nahin hai. The similarity in all the tunes is quite obvious, actually. many times i feel between middle of the song listening when mukhda antra ends only instruments being played that yhaa sey toh yeh gana shuru ho jayega meaning that this tune is d initial of other song. if i get remember i will write. but it has happend with me many times. Came across this yesterday. Apparently there are more : stolen beats from pakistani film songs. Hum bhool gaye re tera pyar. I like the Saheli ( Pakistani ) song. if we watch sangam the background piano score and listen dil ke jhronko mein tujhko baitha k from brhamchari then the initial tune i find is same. when i watched sangam 2nd or 3rd time i felt this that more or less it is same. i want to say i am confused between three songs. i was listening radio after the inital music started i thought it is chand jaisey mukhdey pay bindiya sitara.then thought it is kaali ghodi dwaar chali and last the song came out was khaa sey aaye badra. genuinely confused between these songs. Great Elvis song, Marguerita inspired this hugely popular song, sung by great Rafi from “Jhuk Gaya Aasman”. Not sure being discussed in comments. Oh, yes! I discovered the existence of this when I reviewed Jhuk Gaya Aasmaan. I have been racking my brains since long for the song which I think was filmed on Late Nargis Dutt. This particular song sounds so much like que sera sera. It’s been 25yrs since I heard it and somehow they don’t play such a ones on bhule bisre geet either. I thought about it, but couldn’t think of anything that would fit that description. If it occurs to you, please do leave a comment here. Thanks! From which western music pop-song was the famous Bengali song “Ei Raat Tomar Amaar…” (sung by late Hemanta Mukherjee) copied / lifted / inspired by? I was listening to Delhi FM Rainbow some days ago and I swear that I heard a foreign song, the opening of which was uncannily similar to the opening of “Dekho Mausam Kya Bahaar Hai” from Opera House. If anyone can tell me which song it was, I shall be grateful. I would like to know that too! This is news to me. I finally cracked this puzzle after a little but specific web search. The refrain/chorus of Dekho Mausam Kya Bahaar Hai” was lifted by composer Chitragupt from a 1953 song “Bimbo” recorded by Jim Reeves. Notably, the “bimbo” in the song does not refer to an airheaded young woman but a little/preteen boy who has a mind older than his age. However, to Chitragupt’s credit, the verses of his song have got nothing in common with the original’s verses. During my search I also came upon a reference that Chitragupt’s use of western beats and arrangements led to disagreement and parting of ways between him and his mentor S.N. Tripathi. Considering I used to be very familiar with this song as a teenager (when I listened to a lot of Jim Reeves), I am a little ashamed that I couldn’t spot the similarity… but perhaps that is also to Chitragupt’s credit, since he has changed the tune a good bit. It struck me this morning that ‘Yeh Meri Zindagi, ek pagal hawa, Aaj idhar kal udhar’ is based on Shostakovich’s Waltz No.2 (https://youtu.be/mmCnQDUSO4I). This is a great find! Thank you so much – I hadn’t known about this.